Pinally. A Pilipino art show, pronto! Curated by the fabulous, brilliant Rico Reyes, the show, OVERMAPPED, opens this Thursday at SomArts Gallery. Rico and I have been co-teaching Filipino-American Art History at USF this semester: our students are helping install OVERMAPPED this Wednesday. I hadn’t been mentioning the show because in a typical dent in my logic, I equate blood, sweat and tears with preparation for an exhibition, and since my contribution to this show has involved none of those bodily fluids (hallelujah) for a change, I’ve been spacing it. 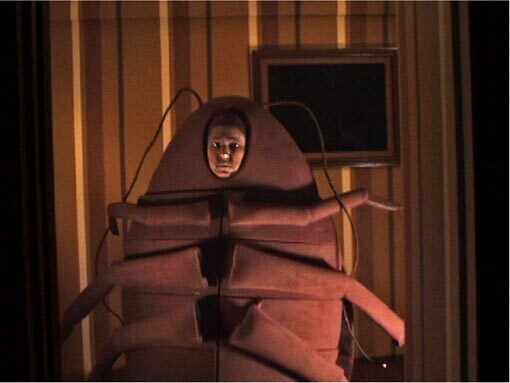 I’m showing my DVD of Motel Cucaracha, which is a piece I made a couple of years ago (which involved copious amounts of blood, sweat and tears at the time). The video was part of a comprehensive motel room-like installation/performance at a.o.v. gallery in 2004/05. It will be interesting to see it out of its original context, on an utterly unadorned monitor. Rico pulled OVERMAPPED together on a shoestring budget (wait a minute: no budget), so it’s one more testament to the dedication of grassroots nonprofiteers that this show is even happening. It shouldn’t have to be done this way, but it’s proof that it can and should be done…Rico seems to do everything so gracefully and thoughtfully: I learn a ton, just watching him in action. He put together a really fantastic, diverse array of artists, including Galleon Traders Johanna Poethig and Eliza Barrios, so I’m really looking forward to seeing the work, and meeting some of the talented folk I’ve admired for a long time! 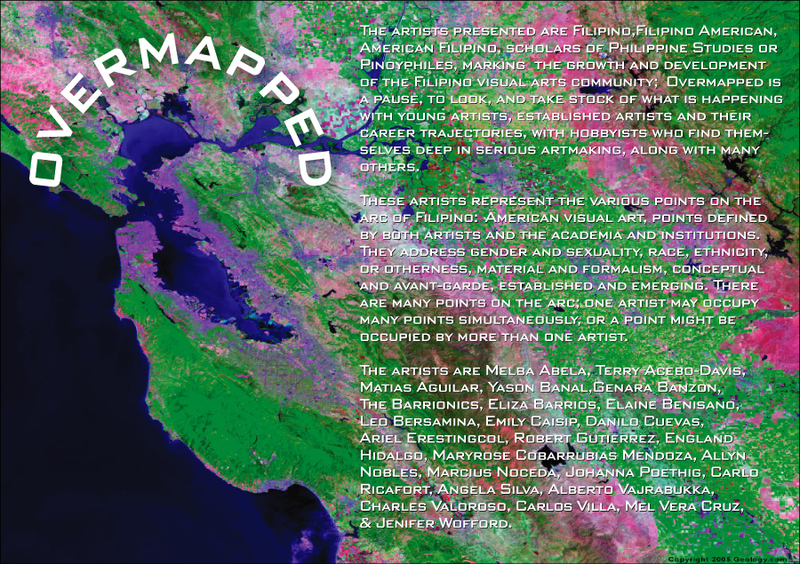 Overmapped: A Cartography of Filipino American Visual Arts is an exhibition looking at the vital and vibrant visual arts community with ties to the Philippines. The artists presented in this exhibition are Filipino, Filipino American, American Filipino, scholars of Philippine Studies or Pinoyphiles. This exhibition is an informal and incomplete survey and by no means an exhaustive study. However, the growth and development of the Filipino visual arts community needs to be marked; there is a need to pause, to look, and take stock of what is happening with young artists coming out of school, with established artists and their career trajectories, with hobbyists who find themselves deep in serious artmaking, along with many others. This moment is as good as any! The artists included in this exhbition represent the various points on the arc of Filipino:American visual art production. The points are defined by both artists and the academia and institutions. There exist the myriad points addressing gender and sexuality, the points of race, ethnicity, or otherness, the points of material and formalism, the points of conceptual and avant-garde, the points of the established and the up-and-coming, etc. There are many points on the arc and one artist may occupy many points simultaneously, or a point might be occupied by more than one artist. The artists included in this exhibition are Melba Abela, Terry Acebo-Davis, Matias Aguilar, Yason Banal, Genara Banzon, The Barrionics, Eliza Barrios, Elaine Benisano, Leo Bersamina, Emily Caisip, Danilo Cuevas, Ariel Erestingcol, Vince Golveo, Robert Gutierrez, England Hidalgo, Mary Rose Mendoza, Allyn Nobles, Marcius Noceda, Johanna Poethig, Carlos Ricafort, Angela Silva, Alberto Vajrabukka, Charles Valoroso, Carlos Villa, Mel Vera Cruz, and Jenifer Wofford. The title of this show is the product of intellectual synergy and confusion. The word “overmapped” is derived from the interplay of ”˜overlap’ and ”˜mapped’. The concept behind the exhibition is to layer on top of the topographical map of the psyche, as developed by Sigmund Freud, with an imaginary topographic sketch of the colonized mind of Filipinos. This overlapping of maps creates a new terrain that shifts with migration and memory, desire and resistance, embodiment and dismemberment, love and hate. These maps are continuously being drawn and re-drawn to charter a course to unknown coordinates. Thus, the act of organizing an exhibition under the theme of “Filipino” becomes a cartographic exercise, redrawing the boundaries of the community and repainting the lines of visual art, in an attempt to speculate a heading and to propose a new course. Coincidentally, the term “overmapped” is also used in computer programming language. An “overmapped error” describes a situation when 1). two or more data directories exists in a hard-drive and each script in the directory competes and confuses the logic of a given set of memory, or 2). the memory chip is overloaded with a datafile that is too big for it. Either phenomenom describes the condition of Filipino artists. From which “directory” does one process information, or is one’s colonized experience too much to handle within a mainstream framework? The psyche of the Filipino artist is like that of the computer chip overloaded with cultural data from two conflicting sources, always alerting its viewer of a process being OVERMAPPED. You are currently browsing the Wofflings weblog archives for the day Monday, April 2nd, 2007.